This enormous creature's serpentine neck supports a leering reptilian head—its body is a wriggling mass of tentacles. This is a breakout SoundSet from a Pathfinder Adventure Path SoundPack. Subscribers automatically gain ownership of this SoundSet. The music in this SoundSet was composed, performed, recorded, mixed and mastered by Benjamin Loomes of syrinscape.com. 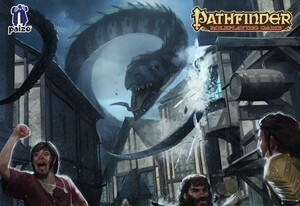 Black Magga Battle SoundSet © 2015 Paizo Inc. Paizo Inc., the Paizo golem logo, Pathfinder, and Pathfinder Adventure Path are trademarks of Paizo Inc. Sounds created under license with Paizo Inc.